whatever it was born to be. Diane Walker is a poet, artist, and actress living in the Northwest. Over 50 years ago when Eisenhower gave that speech, violence had reached a tipping point in the United States, and across the globe. World War II brought death and human conflict at a scale the world had never seen before. Nearly 70 million people died as a result of that war. As a result of human violence and combat. At that particular historical moment, making guns had become more important—and more financially lucrative—than ever before. We make guns, but what do guns make? Do they make violence, or do they make stability and structure? And who decides? These are just a few of the questions Al Farrow asks with his show, “Divine Ammunition,” on now at the Bellevue Arts Museum. 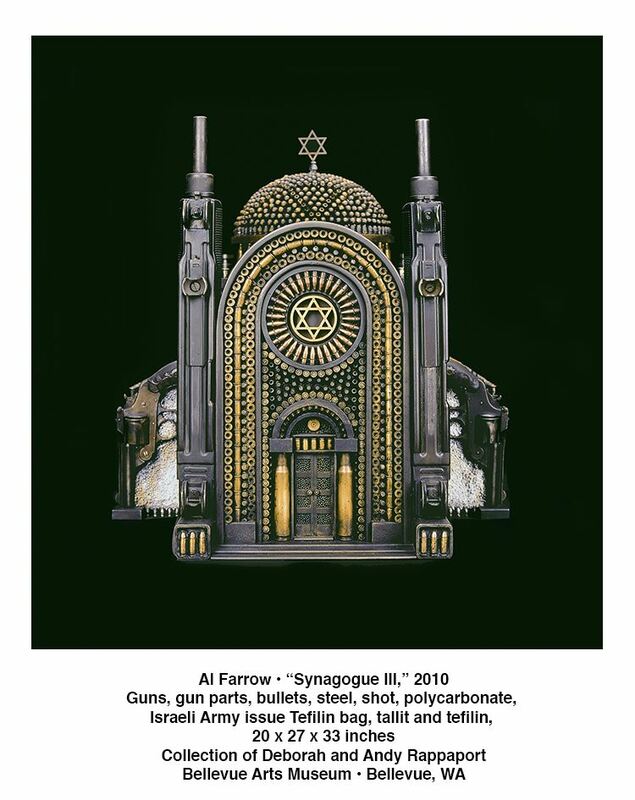 Farrow meticulously crafts sculptures of religious structures and devotional objects—scale models of mosques and cathedrals, along with menorahs, reliquaries, and icons—all out of guns and ammunition. For him, guns make religion. A scholar of both religion and war, Farrow has long been interested in the historical connection between violence and religion. 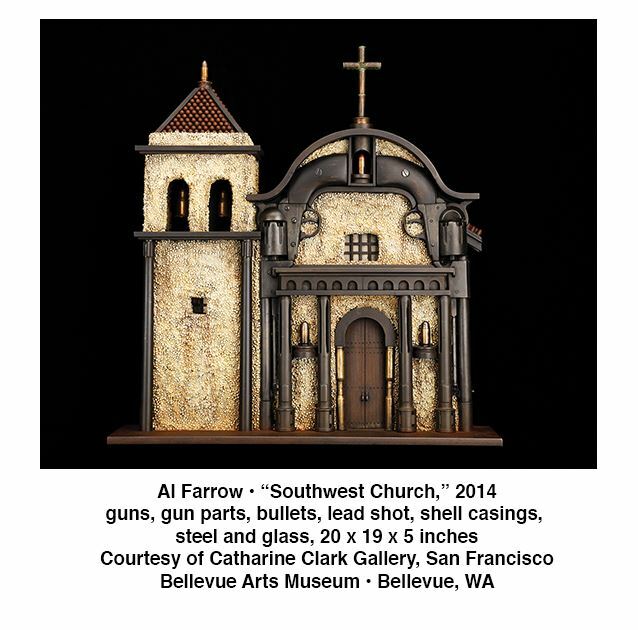 In “Divine Ammunition,” he seems most interested in the forms and objects that emerge from the two—objects like guns and reliquaries. Bullets and flying buttresses. Church domes and Uzis. In Farrow’s work, the forms of violence and religion become almost interchangeable. 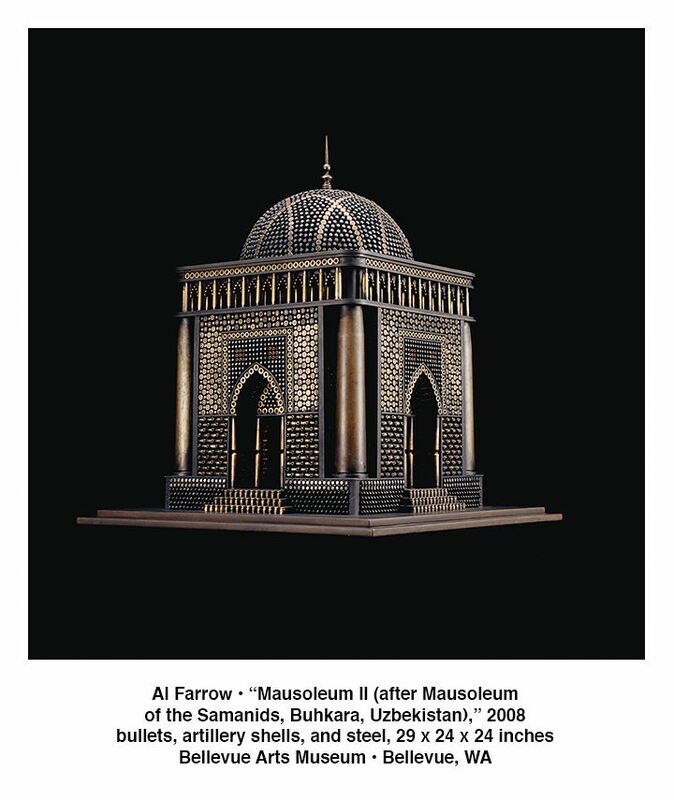 You might not notice that the dome of one of Farrow’s mosques is made entirely out of intricately arranged copper bullets, or that a cathedral buttress is actually a handgun. But look closely, and the munitions reveal themselves. As Farrow reminds us, it is in objects that we as people come to locate intangible concepts like war and religion. Violence lives in our guns, the tools we use to inflict it. Religion resides in cathedrals and mosques, the structures we build to house it. Religious identity lives in menorahs and reliquaries, the devotional objects we use to invoke it. With his work, however, Farrow questions all of this. For him, guns are no longer tools of violence, but instead are used as building materials. They become the foundation of the synagogue or mosque. They are creative rather than destructive. Stripped of their firepower and force, Farrow’s spent ammunition and dismembered guns are left only to their forms, becoming bronze circles and cylinders, miniaturized roof tiles and building columns. Of course, we know that guns don’t make violence and churches don’t make religion. Humans make these things. It is we who are responsible for our technological advancements, for our industrial developments. It is we humans who figured out how to make double-barreled shotguns and double barrel vaults. And it is we who determine to what use these objects and forms are put. Hearing Farrow talk about the process of acquiring his materials—spent ammunition and hundreds of thousands of guns and munitions parts—one is reminded of this very fact. “I used to be very anti-gun and unsympathetic towards the American gun community,” Farrow notes. “I’ve shifted on that, though.” Now, he says, he is more understanding of the various uses to which armament can be put. “I’ve come to realize,” he says, “that gun culture and gun collecting is not so much about violence.” It’s about the object and the appreciation of its historical and cultural significance. Guns are not so far from antiquities and artifacts in that way. “I am a part of that culture now, gun culture,” Farrow admits. His use—artistic creation—is just one of the many uses to which guns and ammunition can be put. The same object can be an instrument of destruction or of creation. It can kill and it can save. And as Farrow reminds us, creation and destruction will always be intimately intertwined—it’s impossible to have one without the other. The danger, though, is when we cloak that destruction and violence in the shroud of something generative, like religion. Because, as Eisenhower reminded us so many years ago, military strength can bring great power and possibility. But the real power comes in how we choose to use it. Lauren Gallow is an arts writer, critic, and editor. You can read more of her work and learn about her immersive art project “Desert Jewels” at www.desert-jewels.com/writing. 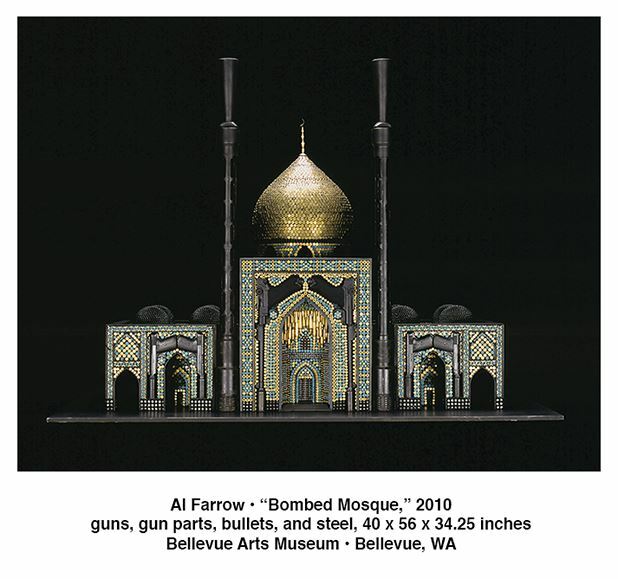 “Divine Ammunition: The Sculpture of Al Farrow” is on view through May 7 at the Bellevue Arts Museum, located at 510 Bellevue Way NE in Bellevue, Washington. Hours are Tuesday through Sunday from 11 A.M. to 6 P.M. For more information, visit www.bellevuearts.org. Tabaimo: Utsutsushi utsushi by Susan Noyes Platt, Ph.D. The fascinating exhibition by the world renowned artist Tabaimo at the Asian Art Museum tells us that the world is not what it seems. Behind mundane objects, in a clothing chest, in a toilet, in a bedroom, lurk other forces, other realities, other creatures, even escape to magic spaces. The exhibition, which the artist also curated, includes four new videos that respond to works in the Asian Art Museum’s permanent collection. 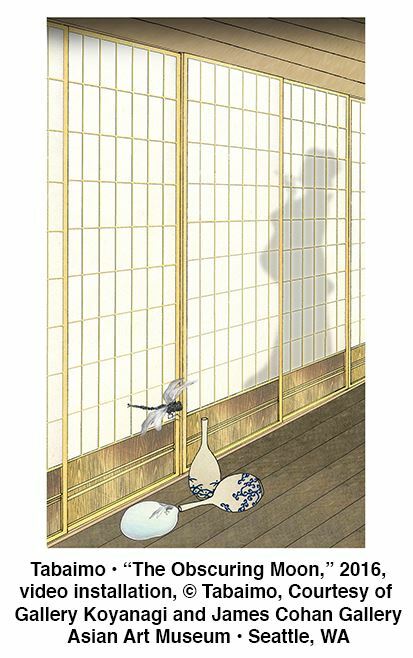 Tabaimo invented the tricky title of her show, “Utsutsushi utsushi” based on the underlying idea of “utsushi” copying or studying a master artist’s work in order to not only understand it, but to grasp its deeper spiritual meaning, to connect across time to it and to honor it. She has turned the concept into an active verb, as becomes clear in viewing the exhibition. She does not just explore the style of the historic master works that she chose for the exhibition, she expands on them, imagining a narrative that takes place inside or beside, or above or below them. Tabaimo’s work perfectly suits the present moment: uncertain, unsteady, unsafe, unpredictable, but it is also deeply poetic. The artist began by paying homage to her mother, Tabata Shion, a ceramic artist, who inspired the unusual title of the exhibition. Tabaimo’s mother practices “utsushi” as a ceramic artist. The exhibition begins with her work juxtaposed to her master, the artist Ogata Kenzan from the Edo period in Japan. Tabaimo practiced her own “utsutsushi“ with specific historical works in the collection of the Asian Art Museum, all of which are included in the exhibition. 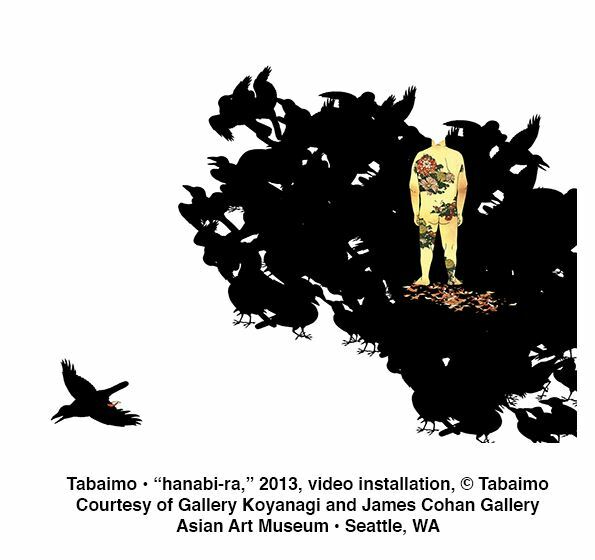 The most straightforward example, and perhaps the thematic heart of the exhibition (although it appears in the last gallery), is Tabaimo’s video in response to the Museum’s unique early seventeenth century six part panel “Crows.” The original awes us with its brilliantly conceived “murder” of crows (as a group of crows is called). 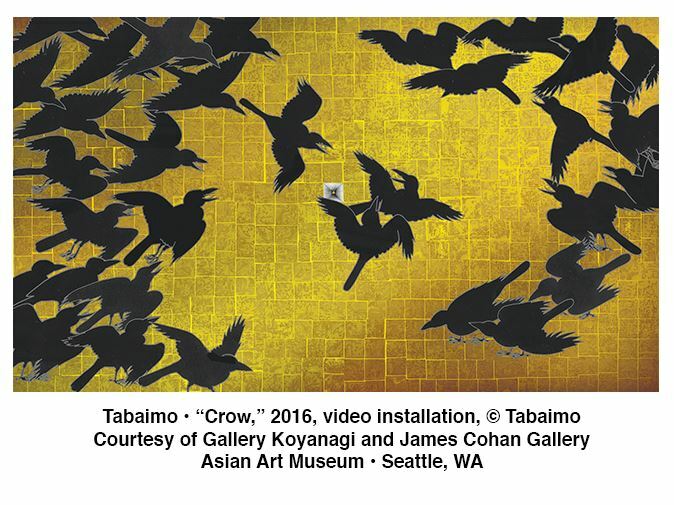 The artist discovered that the crows were so subtly drawn, that she actually had to trace them for her own work, “Crow.” In her video a gold wall opens up into a receding space, as crows fly into it, or land above it. But crows also pop up, and fly into several of the other works in the exhibition. You can look out for them. For another “utsutsushi” her point of departure are two hanging scrolls of “Dragonflies” and “Butterflies,” detailed naturalistic ink drawings and verses, the result of collaboration among over 70 late Edo artists. Tabaimo “liberated” the dragonflies and butterflies in her video, formatted like the scrolls. Now they fly free and disappear from view. But she explored the original work carefully as she recreated the creatures. At the beginning of the exhibition, she pairs two 16th century Chinese wooden chests and a video called “Two,” 2016, which appears on the back of a transparent wall behind the chests, so that their silhouette frames the video. Here we see what I referred to in the beginning, the forces lurking behind the mundane. Initially we see a chest full of bed covers, but then an arm reaches out from a pillow! And it goes on from there. I won’t spoil the experience with too much detail. “The Obscuring Moon” develops a narrative for a shadowy woman who barely appears behind a screen in an original print by Hiroshige. Tabaimo places her in the center of an elusive story. But she carefully emulates Hiroshige’s colors, and we are treated to a roomful of his prints in order to enjoy that connection. Another reference to women is “aitaisei-josei,” a story of suicide, based on a seventeenth century story and a modern novel, “Villain,” by Yoshida Shuichi. Tabaimo creates connections between Ohatsu and Kaneko Miho, the main female characters of the two books, through metaphor and symbolism. Among the pre-existing work, each surprises us in a different way. Most amusing is the “Public ConVENience,” 2006, a three walled walk in with projections of life size Japanese public toilets. The characters come and go with many unexpected actions. “Hanabi-ra” gives us what appears to be a representation of a man covered in flowered tattoos and “haunted house,” on loan from the Asia Society, is a large screen city scape with unpredictable scale shifts, and narrative jolts. Tabaimo utsushi’d the spirit of the voyeuristic aerial cityscape from a 17th century Japanese painting that details the daily lives of city dwellers. We see the original example in the next room. This exhibition is another Asian Art Museum coup, a cutting edge artist in our wonderful “other” museum in Volunteer Park. Just to give you an idea of Tabaimo’s status, she represented Japan in 2011, at the Venice Biennale, and her work is in the collection of Asia Society in New York. Don’t fail to go, as the Asian Art Museum will be closing when it is over, for two years of remodeling and expansion, its first real remodel since it was built in 1933. Susan Noyes Platt, Ph.D. is an art historian, art critic, curator, and activist. She continues to address politically engaged art on her blog www.artandpoliticsnow.com. “Tabaimo: Utsutsushi utsushi” is on view through February 26, Wednesday and Friday-Sunday, 10 A.M. to 5 P.M. and Thursday from 10 A.M. to 9 P.M. at the Asian Art Museum, located in Volunteer Park at 1400 East Prospect Street in Seattle, Washington. For more information, visit www.seattleartmuseum.org/visit/asian-art-museum. Paul Hunter is a Seattle poet whose most recent farming book is “Stubble Field,” (2012, Silverfish Review Press). These pieces hint at another farming collection—“One More Spring.” He has an autobiography in prose poems—“Clownery”—due in January, and is still a fair shade tree mechanic, if he works on a car with no brains. Bronze. Aluminum. Silver, gold, and copper. Iron. Cast iron. Steel. Forged steel, mild steel, stainless steel. When I first saw the theme of this year’s BAM Biennial at the Bellevue Arts Museum—“metal”—it didn’t occur to me how many variations of the material actually exist in this earthly realm. It is one of the most base materials available to artists today. Forged from the ground itself, mined and dug up and extracted from the earth, metal possesses an inherently primordial quality in its very makeup. The flip side, though, is that metal, perhaps more than any other material, conjures a sense of the metaphysical, the cosmic, the supernatural. Metal means alchemy, that ancient sorcery of transforming lead into gold. Metal means magic. The 49 Northwest artists included in this year’s BAM Biennial “Metalmorphosis” explore this and many more of the paradoxes intrinsic to metal. It is both liquid and solid, soft and hard, stable and malleable. Metal has a long history in this region, as local Northwest tribes have made good use of the abundance of copper here for centuries. The maritime industry in the Northwest has also helped generate a large population of metalworkers and tradesmen here. Our region has a history of exploiting the technical possibilities of metal, ultimately resulting in the establishment of the aerospace industry here in the early 20th century. Functionally, metal has a history of driving technological innovation and progress. Artistically, however, historians have long been fascinated with the question of how metal in particular has driven artistic breakthroughs. For many artists in the show, one gets the sense that metal and its infinite possibilities and associations are driving the form. Chris McMullen’s “Haystack” is a prime example of this—the giant wall-mounted steel rods and bronze bearings come alive when you turn the crank at the bottom. Undulating and swelling in time as you crank, the piece recalls a writhing insect in its movements, a sharp departure from the mechanized heaviness of the piece in stillness. For other Biennial artists, however, metal is merely means of solving a problem or visualizing an idea. 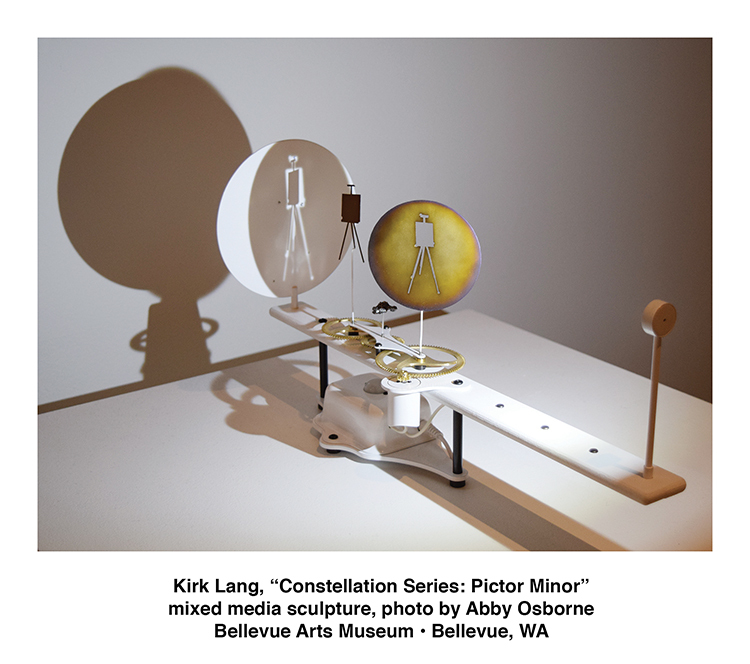 Kirk Lang’s “Constellation Series” uses a light beamed onto thin metal cutouts to cast shadows on the walls behind. The metal forms rotate and move, breaking the shadow image apart and bringing it back together as gears silently crank. The mechanisms producing this movement are clearly visible, but the magic of the image produced by the shadows somehow remains otherworldly. Maria Phillips’ piece “Mapping Monotony” immediately captures your attention upon entering the exhibit, certainly in part because of its scale. But then, its texture. Incomprehensibly whispy pieces of steel dot the white wall, cascading down in tufts and patches of metal that beg to brushed and combed. When I heard another gallery-goer describe the image as “snow-covered grasses,” I did a double take. The white wall now stood in as snow, with the metal tufts reading as plant-like protrusions. That is the beauty of metal—it can take any form we dream it to be. Many artists in “Metalmorphosis” take a different tact, drawing not on the forms of metal, but on its association with machinery and mechanization—the technology that has helped us go faster and stronger as a society. However, rather than blindly embracing this forward movement, several of the Biennial artists question whether this is necessarily “progress.” David Keyes, in his work “Classicism Fleeing the Onslaught of Modernism,” features cast-bronze classical figures being flattened by the printing press. Literally—the piece incorporates a cast iron roller from an actual 19th-century printing press. Keyes makes us wonder how much our reliance on technology and mechanization has similarly flattened our culture, reduced as we are to looking at screens. Andrew Fallat’s kinetic sculpture, “Novelties in Simulacra,” is beautiful in its reminder of how clumsy this technology can actually be. Metal gears, levers, and weights clank together awkwardly, in no sort of rhythm and with no clear purpose. Coming to life at random times, I was in the other room when all of a sudden I heard it begin to move and ran to see what all the ruckus was. There is something ancient and imperfect about Fallat’s work, despite the gears and pulleys pleading of their modernity. Perhaps this is the ultimate beauty of metal. As much as we pull and ply it into modern forms and shapes, it will always be ancient and base. The artists in “Metalmorphosis” remind us that this material, in its infinite uses and formal possibilities, will always speak of its original home. It will always bring us back down to earth. Lauren Gallow is an arts writer, historian, and editor. You can read more of her work and learn about her immersive art project “Desert Jewels” at www.desert-jewels.com/writing. “Metalmorphosis” is on view through February 5, 2017 at the Bellevue Arts Museum, located at 510 Bellevue Way NE in Bellevue, Washington. Hours are Tuesday through Sunday from 11 A.M. to 6 P.M. For more information, visit www.bellevuearts.org. Everything has been Material for Scissors to Shape by Susan Noyes Platt, Ph.D. The title of this stunning exhibition at the Wing quotes from Pablo Neruda’s “Odes to Common Things” which celebrates scissors in every imaginable way including cutting clothes for people from the cradle to the grave. 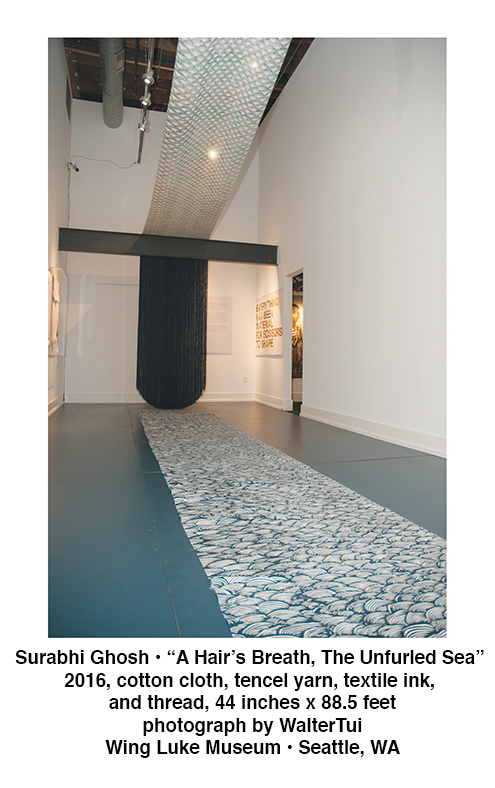 In “Everything has been Material for Scissors to Shape” Stephanie Syjuco, Surabhi Ghosh, and Aram Han Sifuentes, create dramatic textile-based installations that comment on history, mythology and the exploitations of commodity culture. Adding resonance to their work, Portland-based Guest Curator Namita Gupta Wiggers incorporated historical selections from the Museum’s permanent collection into the exhibition. As we enter the first gallery, “A Hair’s Breath, the Unfurled Sea” by Surabhi Ghosh, forms a canopy the length of the gallery, then drops down and flows over the floor. The artist painted the homespun khadi fabric with a pattern that suggests the waves of the sea on the ground and the scales of a flying serpent above. At one end the fabric ends in a curtain of long blue threads that resemble hair. On the wall is an unpainted Khadi bag, its raw cotton physicality reminding us that Khadi connects to Gandhi who spun it, wove it and wore it and encouraged all Indians to do the same, as a means of resistance to colonial rule. Great Britain took India’s cotton at bargain rates, then sold it back as fabric at exorbitant prices. Today, khadi has near sacred status, it cannot be sold or exported, but Ghosh managed to bring the fabric back in her suitcase. While the celestial snake Ananta supports the universe above our heads, the rest of the sweeping fabric refers to a dramatic story about Draupadi, the central female figure of the Hindu epic Mahabharatha. Draupadi asks Krishna to save her honor after she is sold in a card game and forced to disrobe and dishonor herself: her sari becomes endless, the long blue threads suggest her hair that is also protecting her. Celestial serpents, magic saris, and anti colonialism, all connect in this installation. Stephanie Syjuco’s self portraits “Cargo Cults (False Villager)” seem to present a young woman dressed in traditional “native” garb, while actually the artist has purchased all of her clothes and adornments from import stores like Pier I. Syjuco creates the “look” of a “native,” from the fake traditional fabrics and objects, then returns all of them to the store. Around her neck in one photograph, she wears door numbers inverted, that look like a tradition-laden symbolic necklace. The term “cargo cult” refers to post World War II Pacific Islanders who gained status by acquiring commodity items dropped on them from the sky to support troops stationed there. Facing the photographs and further playing with the theme of authentic/inauthentic, baskets from the Wing collection range from ancient and valuable containers to unidentified woven baskets that might actually be cheap imports. The creative display underscores the charisma of museum techniques that can endow objects with authenticity just by means of arrangement and lighting. In the third gallery, Aram Han Sifuentes created “A Mend, A Collection of Scraps From Local Seamstresses and Tailors,” 2011-2013 with the cut off legs of blue jeans. Its sagging gapping forms suggests a weak wall with holes in it, an incomplete quilt, an incomplete story. The artist collected the story of each workers who cut jeans. She listed the people that she interviewed in a small chart which outlines how many years they have been in the US, how many worked as a seamstress, their country of origin, and what work (in many cases a profession), they had in their country of origin. Also paired in this display are archival interviews with garment workers recorded by Wing Luke Museum in 2001, from textile workers in the Pacific Northwest, women who created the clothing that has made us famous. Finally, an interactive exhibit offers viewers an opportunity to create their own embroidery based on historical stitches. The combination of hands on activity, stunning contemporary art, and connections to Asian Pacific American history is vintage Wing Museum. The museum pioneers community-based exhibitions, chosen and curated by community members, such as the second show on display, “Naga Sheds Its Skin” about Khmer Americans, their history, their language, their contemporary presence in the United States, and the horrifying statistics on their deportations. Also on exhibit is Part III of the Bruce Lee exhibitions, “A Day in the Life of Bruce Lee,” which opened on October 1. Martial artist Bruce Lee defied racism in Hollywood and in his life. His gravesite here is an ongoing shrine and performance focus for people from all over the world. (There is a new biopic about him raising new accusations of racism from his daughter). Opposite the Tsutakawa Gallery, the permanent display “Honoring our Journey,” presents painful histories (best known of which is the Japanese incarceration during World War II), and contemporary culture in the US of some of the fifty- one (!) ethnic groups included in the Museum. Finally there is the historical tour of the other side of the 1910 museum building, the East Kong Yick building, the preserved living quarters and cultural center for hundreds of immigrants. 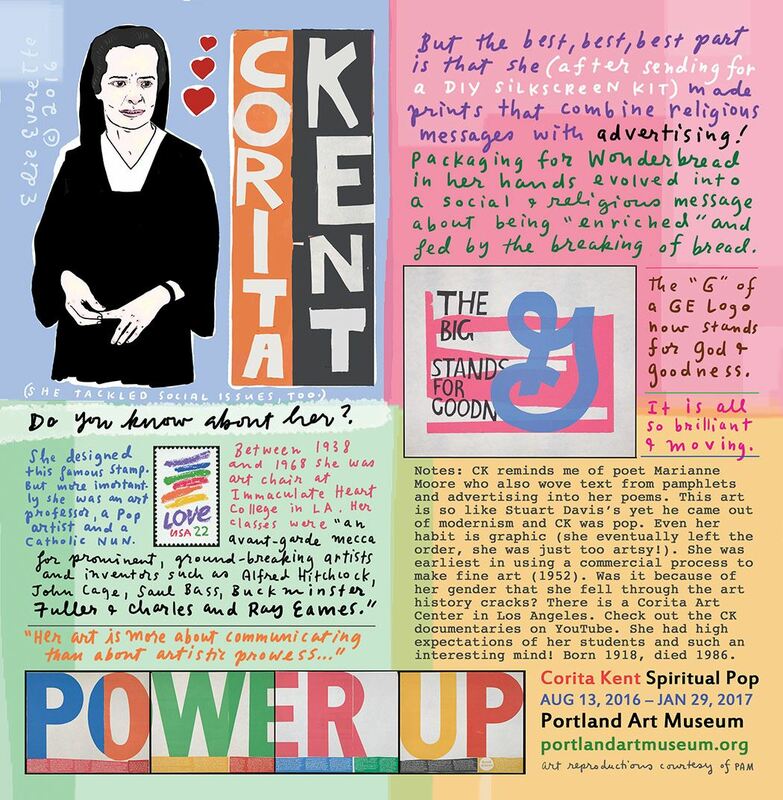 This remarkable museum in the International District is one of my favorite destinations in Seattle, both for its remarkable contemporary art exhibitions as well as its pioneering museology techniques that engage people of all ages and backgrounds. 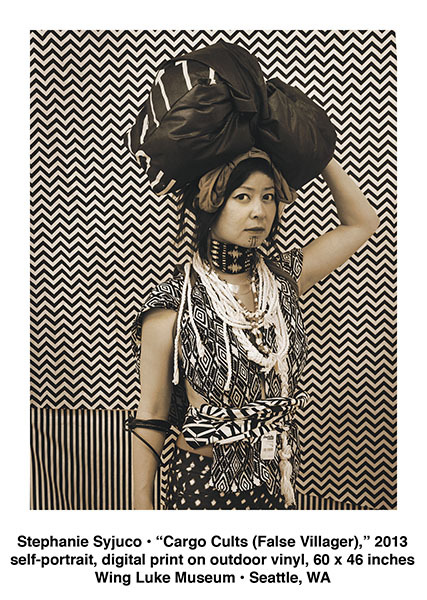 “Everything has been Material for Scissors to Shape” is on view through April 17, Tuesday through Sunday from 10 A.M. through 5 P.M. at The Wing Luke Museum of the Asian Pacific American Experience, located at 719 South King Street in Seattle, Washington. For more information, visit www.wingluke.org.